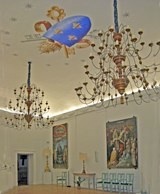 The art collection of the diocese is exhibited in five rooms on the first floor of the north wing of Palazzo Vescovile that formed the Appartamento del Cardinale (i.e. of Bishop Cardinal Cesare Facchinetti (1655 to 1672). The vaults of most of these rooms were frescoed in the Rococo style after the 1762 earthquake. A passage from the museum leads to Sant' Eufemia. ✴two scenes from the life of St Martin, only one of which (St Martin gives part of his cloak to a poor man, on the left) is still legible. ✴the remains of two narrative scenes (an Annunciation and Nativity) and four busts of saints in the lower register. This panel, which is attributed to the Maestro della Madonna Strauss, came from the pieve of Abeto, near Norcia. The panel seems to have been the central panel of a polyptych. The panel depicts the Madonna and Child enthroned in front of a cloth of honour held by angels. The baby Jesus holds a bird. This panel, which is attributed to the Primo Maestro di Santa Chiara di Montefalco came from the church of Santa Maria, Vallo di Nera. The panel, which probably formed the central panel of a triptych, depicts the baby Jesus kissing His mother’s cheek. He wears a Franciscan habit tied with a cord. The prophets in the spandrels carry scrolls containing Marian prophecies. This panel from San Stefano, Picciche, near Trevi, which seems to have been the central panel of a polyptych, is usually attributed to Bartolomeo da Miranda. Filippo Todini rejected this attribution and gave the work instead to Teodoro da Spoleto, who is known from a signed altarpiece (1475) in Santa Caterina, Portaria (6 km south of Acquasparta). The panel depicts the Madonna and Child with angels. Christ above holds a book with the words (translated) “I am the light of the world”. Marco Condulmer commissioned this altarpiece for the high altar of Sant' Eufemia at the time he changed its dedication to Santa Lucia. The altarpiece is usually attributed to Bartolomeo da Miranda, although Filippo Todini has rejected this and designated it as the autograph work of the Maestro del Trittico di Sant’ Eufemia. ✴St Lucy on the right. The predella depicts three scenes the martyrdom of St Lucy. The altarpiece, which is attributed to Neri de Bicci, came from the pieve of Abeto, near Norcia. Unfortunately, it is damaged and has been heavily repainted. The altarpiece depicts the Virgin with St Sebastian and Pope Liberius. Two angels at the bottom kneel before a Crucifix in a tabernacle. The iconography of the Madonna of the snow relates to the vision of Pope Liberius in which the Madonna caused snow to fall in August on the site in Rome on which she wanted him to build Santa Maria Maggiore. Pope Liberius is depicted pointing a plan of the church in the snow. The panel by Filippino Lippi comes from San Montano, Todiano, near Norcia. The presence of so sophisticated a work in such a small village is unclear. The archaic gold background of the central panel probably reflects the taste of the commissioners. ✴On the left, a bear and an ox are harnessed to a plough. The bear had killed the other ox, after which the farmer had prayed to St Montanus, who ordered the bear to take its place. ✴On the right, St Bartholomew the flayed apostle is represented with his skin over his shoulders. This altarpiece, which is from church of Santa Maria in the once prosperous village of Montesanto Vigi, outside Spoleto, is attributed to Domenico Beccafumi. The inscription on the frame records that it was commissioned by the “Pientissima Mulier” (pious nun) Mariangela Sperantiae. ✴the arrival of the Magi. ✴the Annunciation (1545-6) in SS Martino e Vittorio, Sarteano (near Siena), illustrated in this page on the artist in Wikipedia. This painted tabernacle is from Santa Maria di Pietrarossa, Trevi. It contained a miraculous wooden Crucifix (16th century) and was placed on the high altar. The figures displayed (SS Peter and Paul) were originally on the inside of the doors, and thus stood to the sides of the Crucifix when the tabernacle was open for liturgical purposes. It was more normally closed, when the figures of SS Emilian and John the Baptist on the outer doors were displayed. The panel of St Peter is signed by Giovanni Giacomo Tobiolo (from Urbino), and dated. This altarpiece was in the Cappella del Rosario of the church of the Abbazia di San Eutizio until 1940, when the chapel was destroyed by a landslide. Although Abbot Giacomo Crescenzi had built this chapel, he does not seem to have commissioned its altarpiece: the arms at the bottom are not his. The panel depicts the Madonna and Child in glory, passing rosaries to SS Dominic and Catherine of Siena and [with a pope, a bishop and a number of Rosarians behind them]. The painted wooden reliquary bust is from the canonica of San Gregorio Maggiore. The glass-covered hole in the chest of the figure of the saint originally held a relic of a nail that was thought to have been used to pierce the saint's skull during his martyrdom. Prior Decio Gelosi, who discovered this relic (presumably identified by an inscription) in a marble vase in the church, probably commissioned the reliquary. ✴acquired the body of St Pantaleon from Nicomedia and translated it to Cologne in 964. This suggests that the relic of St Pantaleon was sent from Cologne to Spoleto as a quid pro quo. A surviving document records that Pope Urban VIII commissioned this bronze bust from Gianlorenzo Bernini for the Duomo. The commission was made in memory of his years as its bishop (1608-17). The bust arrived in Spoleto in 1644 (the year in which Urban VIII died) and was placed in the niche in the inscription on the counter-facade of the Duomo that commemorates the contribution made by his nephew, Cardinal Francesco Barberini, towards the remodelling of the church. It was replaced by a copy in 1998, when the original was moved to the museum. This bust, which is attributed to Alessandro Algardi, came from the sacristy of San Filippo Neri. It is based on the upper part of the figure of the saint in the group (1636-8) of St Philip Neri and an angel in the sacristy of Santa Maria Vallicella, Rome. This fragment is from an inscription (CIL XI 2 4966) that was originally in San Lorenzo, Terzo della Pieve. It recorded a poem by Bishop Spes (ca. 380-410), in which he commemorated the fact that he had discovered the relics of St Vitalis and dedicated an altar to him. Bishop Paolo Sanvitale (who probably had a particular veneration for "San Vitale") translated the relics and the inscription to the Duomo in 1597. The inscription was broken, probably during its translation but it is known from a transcription contained in a letter written by Bishop Sanvitale and from this surviving fragment. (A reliquary containing the tibia of of St Vitalis, which Bishop Sanvitale commissionedat the time of the translation, is now in the Cappella delle Reliquie in the Duomo). This altarpiece by Sebastiano Conca came from Santa Maria della Manna d’ Oro. This altarpiece by Sebastiano Conca came from San Filippo Neri. This panel by Giuseppe Cesari, il Cavalier d’ Arpino is from the church of San Nicolò in Agriano, Norcia. It depicts Christ in glory with SS John the Baptist, Joseph and Michael Archangel. This altarpiece by Sebastiano Conca came from the Cappella di San Giuseppe of San Gregorio Maggiore. It was removed from the chapel during the re-modelling of the church in 1947-50. This room is to the left as you enter. This altarpiece, which is signed by Bernardino Gagliardi, came from the Madonna delle Lacrime, Trevi. This panel by Pietro Labruzzi is from San Luca. It depicts the Virgin conferring a habit on the founders of the Servite Order. This panel by Lazzaro Baldi is from the Cappella di San Brunone, San Filippo Neri. It depicts the Virgin conferring a habit on the founders of the Servite Order. This panel from San Filippo Neri is a copy of a panel by Giovanni Francesco Romanelli. The original is in the church of Sant’ Eligio degli Orefici, Rome. This bust was removed in 1978 from the the ruined church of San Giovanni di Panaria, between Castello di Perchia and Baiano. Return to Museums in Spoleto.